The Kosgoda Sea Turtle Conservation Project is a small venue in Kosgoda that’s run by volunteers and relies on donations to help protect Sri Lanka’s turtles from extinction. 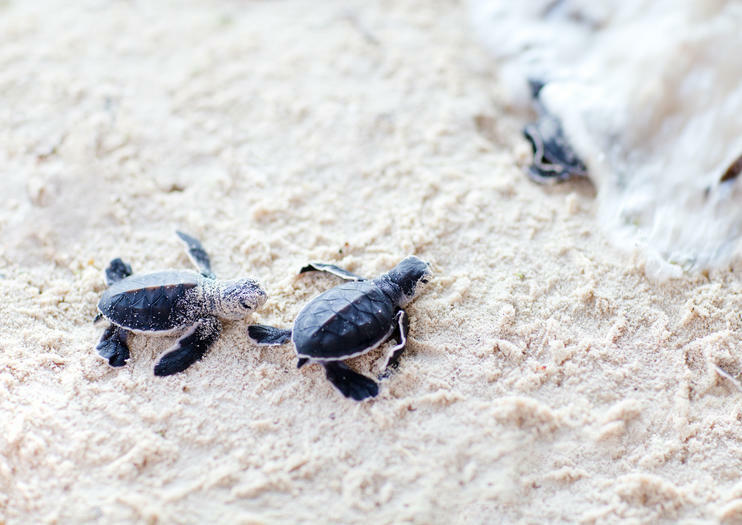 The central aim of the project is to monitor local sea turtle activity and to conserve the local nesting sites. A crucial element is the hatchery, where rescued eggs can hatch safely, away from the clutches of potential predators (or poachers) before being released into the ocean at night. In addition, a selection from each hatching are kept at the sanctuary for a short period for 'headstarting' before their release. Another of the project’s aims is to increase public awareness of how endangered the creatures are and just how important it is to help protect them as a species. Volunteers are on hand to show guests around the various tanks to see (but not touch) the different types of turtles. These volunteers are generally well-informed and encourage visitors to ask questions and find out more about the project. The site of the Kosgoda Sea Turtle Conservation Project is situated on the main Galle Road connecting Colombo to Galle. The Kosgoda Railway Station is also only a few kilometers away. Experience the colorful colonial city of Galle on this 7-hour day tour. Depart from Kalutara or Bentota with a guide and Turtle Hatchery, Bentota Beach, Tsunami Photo Museum, and the Moon stone mine. Explore Galle Fort and learn more about its tumultuous history as a hub for trade. Hotel pickup and drop-off are included. Experience multiple cities and popular attractions of Sri Lanka during a private 7-night tour with a comprehensive itinerary. Your guide provides insightful commentary at the World Heritage-designated Sigiriya Rock Fortress, Golden Temple of Dambulla, and Sri Dalada Maligawa (Temple of the Sacred Tooth Relic). Visit the Royal Botanic Gardens and Galle Fort, tour a tea plantation, see the UNESCO-listed city of Kandy, and more. Round-trip transportation from Colombo is included. Cover the highlights of stunning, attraction-packed Galle on this full-day, VIP private tour from Colombo. Visit a range of historical and natural sites of interest, from the iconic, Dutch-built Galle Fort to a local sea turtle hatchery. Tours include comfortable, air-conditioned vehicle transfers between locations with hotel pickup, plus a tasty restaurant lunch and king coconut. See more of Sri Lanka in less of the time with the help of your personal chauffeur/guide on this door-to-door day tour. Catch some rays on Bentota Beach; get up close and personal with baby turtles in Kosgoda; cruise the mangroves of the Madu River; visit a moonstone mine; and tour the Dutch fort and fish market in Galle. Along the way, enjoy an international buffet lunch. Sri Lanka beach best tour for 11 days is exclusively designed for beach lovers. Enjoy the Sri Lanka beach best tour with your own private driver/guide. Your itinerary covers Negombo, Bentota, Maduganga Boat Safari, Kosgoda Turtle Farm, Negombo Fish market, Galle fort, Galle light house, Meetiyagoda moonstone mine, Weligama Stilt Fishermen, Hummanaya Blow hole, Mirissa Whale watching, Scuba diving, Snorkeling, Tissamaharama Yala Safari, and also the Colombo City Tour. Hotel accommodation with breakfast, All Entrance Fees, Special Guides for all UNESCO sites are all included in the price. You will be spending 2 nights in each destination except Negombo and Colombo. Book "Sri Lanka beach best tour" for a memorable vacation in Sri Lanka. Galle is one of the historical part of this beautiful country.Most beautiful beaches and historical rivers. Galle is a jewel. A Unesco World Heritage Site, this historic city is a delight to explore on foot, an endlessly exotic old trading port blessed with imposing Dutch-colonial buildings, ancient mosques and churches, grand mansions and museums. Wandering its rambling lanes you'll pass stylish cafes, quirky boutiques and impeccably restored hotels owned by local and foreign artists, writers, photographers and designers. See the highlights of Sri Lanka on this 6-night private tour of iconic attractions and destinations. Visit the New Ranweli Spice Garden; see the UNESCO-listed Sigiriya Rock Fortress, Golden Temple of Dambulla, and Sri Dalada Maligawa (Temple of the Sacred Tooth Relic); go snorkeling in the coastal town of Nilaveli; and take a city tour of Kandy, where you’re treated to a cultural show. Enjoy personalized commentary and transportation by private vehicle, plus hotel accommodation. Discover maritime magic on this 10-hour private day trip to Galle, from Colombo. Get an unforgettable insight into local life, and sample delicious foods (at your own expense). Visit renowned attractions such as Rumassala, Jungle beach, Galle Fort, and the Turtle Hatchery. Your Tour will be coverd the highlights of Sri Lanka’s south coast on this day trip from Colombo, Negombo or Mount Lavinia. Walk along the ramparts and cobblestone pathways that crisscross the Dutch Fort of Galle, a UNESCO World Heritage site. Visit a mask factory in the coastal town of Ambalangoda and take a memorable boat ride on the Madu River of Balapitiya, finishing at a turtle hatchery. You’ll learn about Sri Lankan culture and nature from a knowledgeable guide along the way. Giant Blue Madu River Boat Safari in Sri Lanka. ... Madu River is located in the south of Sri Lanka near Galle. The water of the river is dotted with small islands and the banks are all covered with lush mangrove forests that are home to dozens of incredible animal species. You will be picked up form your hotel in Bentota / Beruwela at 0800 hrs and proceed to Yala. Evening you will enjoy a Game driveat the Yala Park at 1500 hrs. Overnight at your hotel in Yala. You will enjoy 2 game drives during your stay.Yala is famous for its big herds and large number of Elephants, Leopards, Spotted Deer, Sambhur, Crocodiles, Mongoose, Wild Boar, Wild Buffalo, and many other animals. More than 130 bird species are recorded which includes the resident and winter visitors.